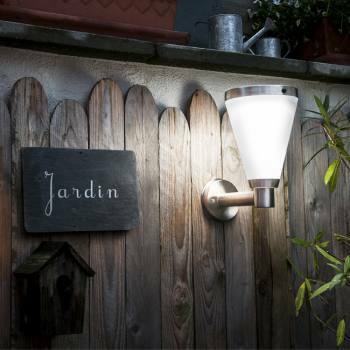 Our solar-powered wall lights will accentuate gazebos, tool sheds, garages, barns and greenhouses. They are easy to install and operate. The built-in motion detector can light up an area automatically when someone enters its detection zone. PIR wall-mount light provides a clever solution because it is particularly economical with its stored energy. It comes on automatically when it gets dark, but only in low light mode" for orientation. A second super bright LED comes on for about 1 minute when someone enters its detection zone (138°) and provides a brighter light than most other one-mode solar-powered lights.